Garlic has been used for millennia as both a food and medicine. Although most studies of garlic's benefits involve raw or powdered garlic, odorless garlic products now dominate the supplement industry as equally healthy alternatives to their pungent-smelling counterparts. If you are interested in using odorless garlic supplements for any purpose, consult your health care provider about the possible benefits and risks. According to the National Institutes of Health, bad breath and body odor are the most common side effects associated with garlic supplements. Although odorless forms of garlic still contain trace amounts of malodorous sulfur compounds, these processed products generally cause fewer side effects than conventional forms of the supplement. Odorless garlic is less likely to cause halitosis, or bad breath. It is also less likely to cause the pungent, sulfurous body odor classically associated with garlic. However, there is no evidence to suggest that garlic's other side effects, such as headache and dizziness, can be prevented through the use of odorless supplements. Garlic works in a variety of ways to promote overall heart health, according to the University of Maryland Medical Center, or UMMC. Compounds in garlic supplements help to prevent platelet aggregation, or the clumping of blood cells. They may also cause modest reductions in total and low-density lipoprotein, or "bad," cholesterol levels. Additionally, the UMMC notes that garlic can help to reduce blood pressure. 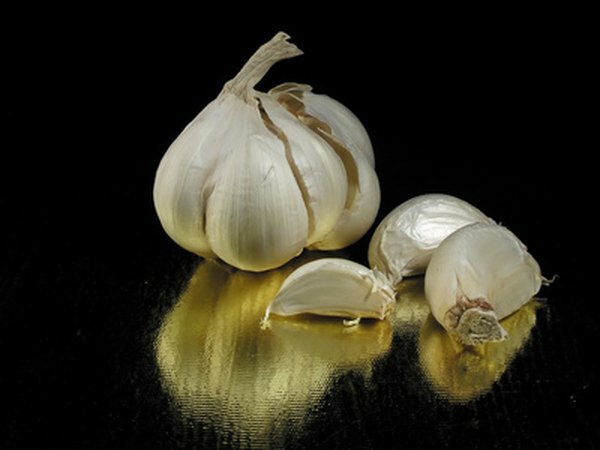 Although the American Heart Association acknowledges garlic's potential as a preventative substance in regard to cardiovascular disease, the association also notes a lack of consistent evidence regarding the relative efficacy of varying preparations. Daily supplementation with odorless garlic may help to prevent several common forms of cancer. According to the UMMC, people who consume garlic regularly have lower rates of stomach and colorectal cancers. Limited evidence also suggests that garlic can help to prevent cancers of the breast and throat. The UMMC attributes these benefits to garlic's potent antioxidant activity and its ability to stimulate immune function. These findings are promising; however, it is important to note that most studies have involved raw or fresh garlic as part of a diet. .
Odorless garlic supplements may play a role in the prevention and treatment of the common cold, according to the UMMC. People taking garlic supplements acquire significantly fewer colds than people taking a placebo. Additionally, the National Institutes of Health report that garlic may help to reduce the severity of upper-respiratory infections, including coughs and colds. These findings are encouraging, but it is important to note that there is no cure for any viral infection. Unless otherwise directed by a qualified practitioner, do not rely upon garlic alone as a treatment for any disease or condition.